In a medium bowl, add all the dry ingredients, including the cheese. Whisk together together the dry ingredients. Make a well in the center. Next, add the oil and water to the flour mixture. Stir until a soft, sticky dough is formed. Note: Remember the 1 tbsp of oil? Place on your hands to help while kneading. Continue kneading until the dough is smooth. Divide and shape the dough into four quarters. Leave to rest for 10 minutes. On a lightly floured surface set one of the quarters on top. Divide in half and roll out to ⅛″ thick and carefully place into a baking sheet, like the one below. Note: You can also use rectangular baking sheets. Just roll the dough out a bit rectangular before placing it on the baking sheet. On the baking sheets continue rolling out the dough to meet the sides. You can also press out the edges with your hands if the rolling pin doesn’t fit properly. Next, using a pizza cutter, a cookie cutter (as above) or a sharp knife, cut the flattened dough into individual crackers. The cut could be into squares, diamonds or any shape you desire. Be creative. Prick with a fork. This prevents them from puffing up during baking. Lower the oven to 350°F and bake the crackers for 10-12 minutes, until golden brown. Note: This is where you’ll have to be very watchful; thinner crackers will obviously bake quickly than thicker ones, so remove the crackers as they get golden brown and continue baking the rest. 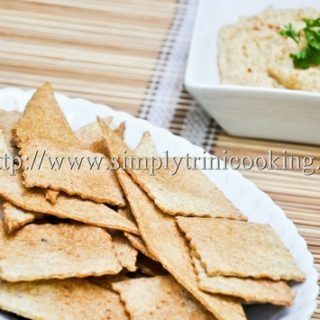 While the first batch of crackers is baking, prepare the remaining dough repeating the steps. We had enough baking sheets to do one quarter of the dough at a time. Cool and store the crackers in an airtight container. This cracker recipe can be bent to your will. You can add toppings and seasonings of your choice to further push the flavour. Try using Parmesan cheese, sesame seeds, dried herbs, paprika, garlic etc into or on the dough. Again, there are way too many variations for me to document so experiment away.